Grand Canyon University partners with Onlinedegree.com to make college education more affordable! Grand Canyon University (GCU) and OnlineDegree.com are working together to help make higher education more affordable and accessible for people across the country. Prospective GCU students will be able to satisfy general education requirements at OnlineDegree.com through self-paced online courses, tuition-free to the site’s participants. Thus, significantly lowering the total cost of education and removing impediments that often prevent individuals from taking initial steps toward their degree. At OnlineDegree.com, students can receive college credit toward their degree taking online courses without the normal applications, entrance exams, or tuition associated with traditional institutions. The fast-growing platform was created by startup veterans and leading academics in higher education to help people go back to school. OnlineDegree.com not only prepares adults for collegiate learning, but works with participating accredited universities to award transfer credit for student’s completion of the courses. With thousands of students now enrolling every month, this provides a flexible pathway for busy adults to complete general education requirements and lower the cost of a college education. Grand Canyon University is Arizona’s premier private Christian university helping students find their purpose with next-generation education, including over 200 academic programs with many in high-demand fields. GCU offers traditional students and working professionals generous scholarship opportunities, student support resources, state-of-the-art facilities, and more. A nonprofit institution accredited by the Higher Learning Commission, GCU has been providing a consistent and effective online learning platform for more than a decade, with an advanced online learning management system and a variety of online library resources available anytime, anywhere. Through the alliance with OnlineDegree.com, prospective students will have up to 44 units of available credit that could be applied toward a degree at GCU. OnlineDegree.com students will also receive an additional 10% scholarship off tuition from the standard tuition rates when they enroll. For more information, students can visit https://bit.ly/2SRpFhX . On a mission to make higher education more affordable and accessible for everyone, OnlineDegree.com is a team of startup veterans and leading academics who believe everyone should have the ability to go to college. Through its free platform, students can explore different courses and subjects on their own schedule, be better prepared for collegiate learning, and could receive college credits toward their degree at participating universities throughout the United States. Working adults now have a bridge to start their path back to school regardless of their finances or busy schedules. https://www.onlinedegree.com/about-us/. Pricing Alert: Rates increase tomorrow. Secure your spot today at the world’s largest event on performance marketing. Lock in your seat today with over 2,700 leading performance marketers from around the world. Get the latest insights and strategies on how to maximize your acquisition, conversion and retention strategies. Sign up today to save up to $350 off onsite prices. Use Discount Code: EDUVIP to save $100 off the current rates. The number of students who were enrolled exclusively online grew to 15.4 percent which is up from 14.7 percent in 2016, or about one in six students. The percentage of all students who combined online and in-person courses grew faster, to 17.6 percent in 2017 from 16.4 percent in 2016. The percentage of students who took at least one course online grew to 33.1 percent, from 31.1 percent in 2016. Online education continues to prove it’s not only here to stay but growing. With traditional non profit institutions, OPM’s & for-profits continuing to cater to this growing market it’s clear that there is a lot of opportunity ahead. Most of the traditional non profits who succeed are generally partnering with OPM’s like 2U or OPM alternative facilitators like Edufficient. Those who try it alone continue to have a high failure rate. 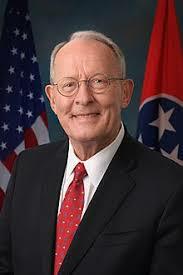 Tennessee Republican Lamar Alexander, one of the few pragmatic dealmakers left on Capitol Hill, is the first senator to announce he won’t run for re-election in 2020. Alexander is currently the chairman of the Senate Health, Education, Labor and Pensions Committee. He worked with his Democratic counterpart, Washington Sen. Patty Murray, on a bipartisan plan to stabilize the Affordable Care Act, though that effort would ultimately fade as the GOP and the White House unsuccessfully tried to push through their own replacement plan last year. His departure after 2020 could leave a significant void in Congress when it comes to leadership on education issues. “What I believe is that when we take the handcuffs off, we’ll unleash a whole flood of innovation and ingenuity classroom by classroom, state by state that will benefit children,” Alexander said. He kept a close eye on the law after it passed and wasn’t afraid to defend what he thought were its strongest points. Most notably, at the start of the Trump administration, he led the push to scrap the Obama administration’s accountability regulations for the law, which he said went beyond the bounds of ESSA. Education Corporation of America, owner of a national chain of for-profit schools including Virginia College and Brightwood College in Maryland, is ending operations this week in the face of dwindling enrollment and regulatory pressures. “This is not the outcome that we envisioned and is one that we recognize will have a dramatic effect on our students, employees and many partners,” Diane Worthington, a spokeswoman for Education Corp., said in a statement Wednesday. The abrupt closure will leave some 20,000 students at more than 75 campuses scrambling to complete their education once the current term ends Friday. Worthington said the company, known by its acronym, ECA, will ensure students can access their transcripts to transfer to another school. On its website, ECA promises students it will provide information within two weeks about transcript requests and recommendations on where to transfer. The haphazard planning has drawn the ire of the Education Department, which has been in talks with the company to create a transition plan for students, according to department spokeswoman Liz Hill. Colorado State University-Global Campus has partnered with OnlineDegree.com to provide 33% of Bachelors Degree Tuition Free! In its ongoing commitment to make college more affordable and accessible, Colorado State University-Global Campus has partnered with OnlineDegree.com to help bridge more working adults back to higher education. The partnership will enable students to take certain general education courses offered at OnlineDegree.com that could apply toward their degree at CSU-Global. Tuition-free. OnlineDegree.com is a non-collegiate platform that prepares working adults for higher education and helps them receive college credit in the process…completely, free. Students can take a variety of general education courses to learn about psychology, computer programming, history, marketing, robotics, and much more — all online and at their own pace. OnlineDegree.com works with participating accredited universities where transfer credit can be awarded for successful completion of the courses. This provides students with a simple process to begin their education, and gives them a multitude of options to potentially receive free college credit nationwide. CSU-Global is already a known leader in accessibility, becoming the first independent, fully accredited, 100% online state university in the U.S. in 2007. With over 28 degrees and accelerated programs, the academic offerings have been designed specifically for working adults. In addition, they offer valuable services for non-traditional students, including career counseling, financial planning and tutoring. The partnership with OnlineDegree.com is another step to help aid students on their path to a degree and provide them a tuition-free option to reach their 13 credit threshold to transfer. Leadscon Connect to Convert Boston Conference Discount code for MarketDrivenEDU members! Leadscon Connect to Converts Boston Conference Discount code for MarketDrivenEDU members! Education lead models are evolving and new verification tools, platforms, and business models are enabling a strong shift from quantity to quality. 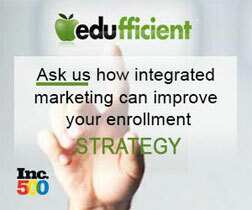 With this evolution, it’s critical that EDU lead buyers have the latest resources to improve ROI and conversions. All of these resources will be available for you at Connect to Convert, October 3-5, 2018 at The Westin Boston Waterfront. What is LeadsCon’s Connect to Convert? LeadsCon’s Connect to Convert is the lead industry’s only roll-up-your-sleeves educational conference and exposition dedicated entirely to the most effective and emerging sectors of the lead generation industry: Calls, Clicks, Search and Shares. With dedicated b-to-c and b-to-b content designed around each section of the sales cycle, LeadsCon’s Connect to Convert will arm you with the critical intelligence you need to succeed in 2018 and beyond. 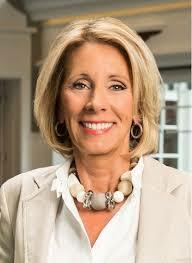 Betsy DeVos plans to eliminate gainful employment regulations!! Education Secretary Betsy DeVos plans to eliminate regulations that forced for-profit colleges to prove that they provide gainful employment to the students they enroll, in what would be the most drastic in a series of moves that she has made to free the for-profit sector from safeguards put in effect during the Obama era. The so-called gainful employment regulations put into force by the Obama administration cut off federally guaranteed student loans to colleges if their graduates did not earn enough money to pay them off. That sent many for-profit colleges and universities into an economic tailspin because so many of their alumni were failing to find decent jobs. The Obama regulations — years in the making and the subject of a bitter fight that pulled in heavy hitters from both parties who backed the for-profit schools — also required such schools to advertise whether or not they met federal standards for job placement in promotional materials and to prospective students. 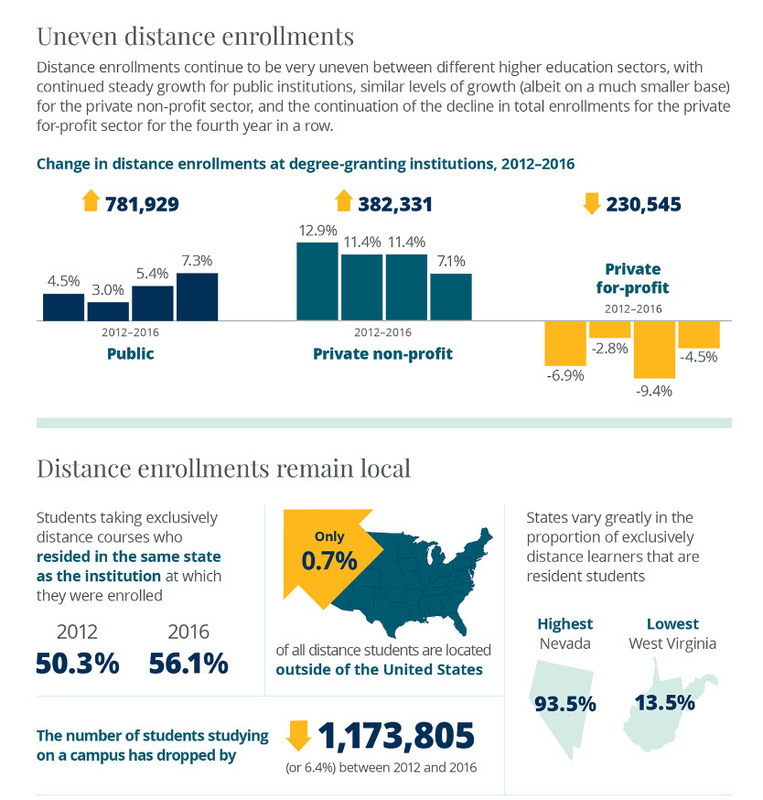 Distance Education across the US has been growing steadily, with the exception of for profits. Tracking Distance Education in the United States – a recent report released by Babson Survey Research Group (BSRG). show the dramatic shift.